"When the pope was carried in the sedia gestatoria, Noble Guards walked alongside the papal chair. During the hours reserved for papal audiences, guardsmen also stood in the antechamber of the papal apartments and, on formal occasions, on either side of the papal throne. 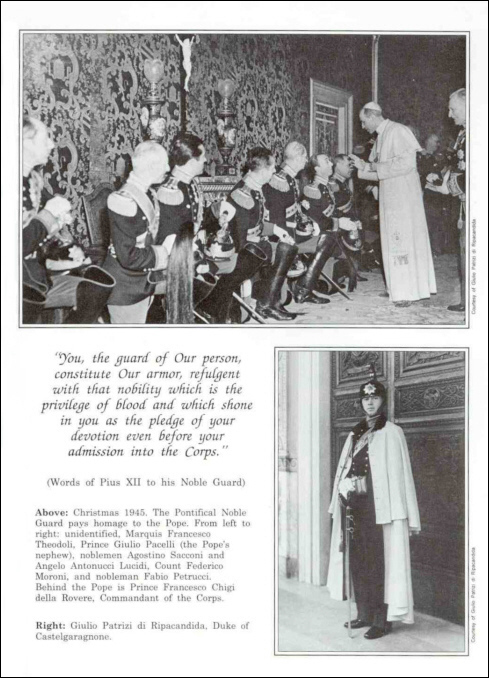 During the Second World War, the Noble Guard shared responsibility with the Swiss Guard for the personal security of Pope Pius XII. For the first time since 1870 pistols were issued to duty personnel. Throughout the war, Noble Guards mounted guard outside the papal apartment night and day and guardsmen followed Pius XII when he took his daily walks in the Vatican Gardens." "You, the guard of Our person, constitute Our Armor..."